The Youth is a skirmisher unit made up of young and inexperienced warriors, freemen of the lowest rank, lightly armed troops who should break up and harass enemy formations before the main battle lines meet, acting as a screen for heavier and more valuable troops. The Jugundiz is a unit of lightly armed skirmisher troops who break up and harass enemy formations before the main battle lines meet, and act as a screen for heavy troops, taking losses in order to increase the odds of survival of more valuable “proven” warriors (Dugundiz) who stand just behind. They must first prove themselves in battle in order to earn experience and status and fight beside their betters. Their skills also make them useful in springing tactical ambushes. 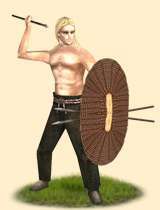 Each warrior is armed with a bundle of throwing spears, a slightly longer spear for melee and a stout ovular shield, but they do not wear armor, being poor and of low status, but also choosing speed over protection. Historically, the Youth are composed of a tribe’s young and inexperienced warriors. These men had yet to prove themselves as warriors, having had little practice in close combat, but like all Germanic warriors were eager to gain honor in the face of battle, and more steady skirmishers for it.